I’m just curious about the KS.. I can’t seem to find a manual on one either. Is there a sheet that would be considered too thin for this machine? I was told stock below 100# might give me problems for die cutting. And that there can be considerable shifting/twisting of the thinner sheets while die cutting in this particular machine. Any knowledge is greatly appreciated! thanks! If your press is equipped with a sheet brush it will help with thinner stock. Also look at your forms and put corking/rubber in the middle of large voids to prevent sheet sag. No reason you can’t run even onionskin on the press, just more fiddly make-ready. Thanks! I’m looking at die cutting a bunch of circles out of a full 38x52cm sheet. do you suggest running this pretty slow as well? I haven’t cut anything thinner than 80# book on my KS, but no problem there. One problem could be the tight turn as the sheet heads into the delivery, but there is an optional suction feature on my KS to help control a light sheet. (Deselect the “show only most popular manuals” option to display these.) Unfortunately the operation manual is not the original KSB manual, but rather from the later K-series supplement booklets. To get die-cut circles to deliver, you will need to nick and lead and trailing edge of the circle just enough to hold together. Also make sure the grain direction is parallel to the cylinder, otherwise the form will tend to be self-bursting (no fun). Hello to anyone that can help..
I’m having two problems with die cutting on the KS. 1. massive amount of paper flecks are being created along the cut of the outer perimeter while die cutting circles [and sticking to the edge, not falling off. i basically need to sand them off]. 2. the paper appears to be busting open hours later after die cutting from the KS, but NOT from our Heidelberg windmill..
the Windmill is such a clean cut, whereas the KS leaves a very jagged edge along the cut. usually from a very dull die. are you using the same die in each press? is your cylinder blanket indented from the die on the KS? We have two separate dies, but with the similar layouts.. And both are producing the same results. By cylinder blanket, do you mean cylinder jacket? If so, it isn’t indented, but is starting to show some early wear. We aren’t using a steel plate under the die board either, just a thin sheet of aluminum -which seems pretty beaten..
ya, a cylinder can dull a die in just a few cycles. there is very little contact area vs your windmill. If you are inexperienced with dies, i would recommend getting it to your die maker for an assessment of the cutting rule condition. If you shine a light on the rules and can see the cutting edge, it is dull. Or if you can slide your finger nail from the board up to the cutting edge and your nail catches at the cutting edge, the die is dull. Die cutting is much more precise than many give credit for. the more exact your make ready, the longer your die will last and the better your pieces will look. Om the windmill, If it cuts at the bottom first, reduce packing and crank up pressure. If it cuts at the top first when cranking up pressure, back it off and add packing. Then start spotting make ready. You can bring up pressure until 20-30% of area is cutting before spotting. Cylinders need to be spotted under the die with little packing behind the jacket. Carefully. Might just be an *Astute* move to actually publish the required difference in Rule Heights between Platen and Cylinder requirements.? U.S. Spec. of course. mick Hopper across the old pond I use .918 cut rule on both my heidelberg platen and the cylinder presses. To me .937 is a dirty word. tbtb95 is your cylinder over packed? 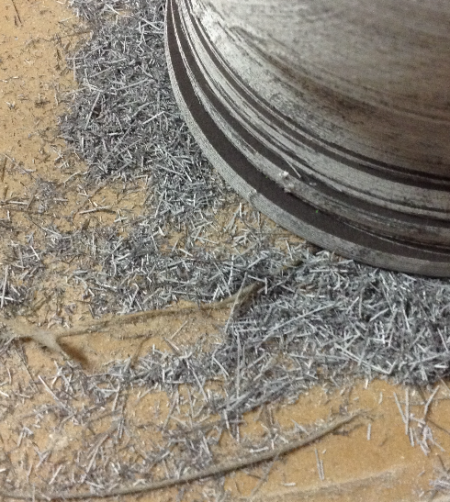 That will dull you die cut edge very fast…from the picture it looks like it is. I have old cutting dies that leave a jagged edge similar to your picture and use a razor blade to take/flake the excess off. What do you mean by busting open hours later? I don’t need to adjust the packing under the cylinder jacket, but I do on the heidelberg. I do pack behind the die as needed. Cylinder die cutting Rule around the cylinder works incremental and cuts easy across is simultaneous and requires more pressure. Dies made for cylinders usually have rule that goes around the cylinder to be up to .008” lower than across the cylinder. I have cut millions of circles on my KSBA and I make my die so it just cuts around the cylinder then makeready under die jacket for low spots across the cylinder. Diecutting circles on a cylinder can be a challenge as there is no definite across an around point like a carton or folder die. G W A K, Extreme Apologies. the *Old Goat* has been less than Gentlemanly for a long time, to St. Paul,s favourite Daughter. Thank You for Your response to My *astute* quip, but there seems to be a lot of (as D.T. would say) fake news OR lack of relevant details, or presence of would seem to be more helpful to the, as yet, UN-informed. With luck and a Fair wind, maybe, some of the Ill informed Posts may be edited, up to speed and the *Height* quandaries (as the news print(ers), used to say, >Can be put To Bed< !! !